No shoes, no shirt, no parking. They look innocent enough; tiny little fenced-in decks outside Italian cafes, yogurt shops, and falafel parlors, where San Franciscans sip fair trade espressos and chai lattes while they inhale the heady aroma of Mini, Fiat 500 and Vespa exhausts and watch Priuses glide by on battery power, silent as golf carts. The chairs and benches these people sit on protrude past the normal boundaries of the sidewalk and six feet into the street, where only a few months before there were parking meters, parking spaces, and the cars that were lucky enough to find a space. What, you may wonder, is going on here? These little islets of urbanity are called parklets, and they are popping up faster than travel agents at a hotel presentation with a free buffet. Two years ago, there was no such thing as parklets. Today, the city has 31 of them, with 39 more in various stages of review, and many more applications on file with the City Planning Department’s Pavement to Parks program. As background, the city has over 470,000 registered vehicles, plus another 35,000 that visit every weekday, and only 320,000 street parking spaces. According to a recent UC study, 1/3 of the traffic in downtown San Francisco is cars circling around looking for parking spaces. So who, exactly, came up with the bright idea to tear out the city’s precious inventory of parking spaces and replace them with these cute little latte zones? Evidently, the idea was hatched in 2005 out of PARKing Day, the annual fall day when residents reclaimed a parking space for the day, by rolling out Astroturf, chairs, tables and plants to create a temporary park. In March 2010, the first city approved parklet was built in front of Café Mojo on Divisadero Street and these invasive little parks started spreading like kudzu.The threat isn’t just confined to San Francisco; the parklet movement has already spread to Oakland, Long Beach, Philadelphia and Vancouver. Already, parklets have grown past the two-parking space limit. In 2011 the largest parklet was installed. The Powell Street Promenade is a two-block long installation that stretches between Ellis and Geary. Ironically, it was sponsored by Audi. According to SFStreetsblog, it could be the forerunner to a permanent closure of this street. “The promenade may one day lead to the pedestrianization of those two blocks of Powell, which are scheduled for a cable car overhaul and repaving in 2014”. 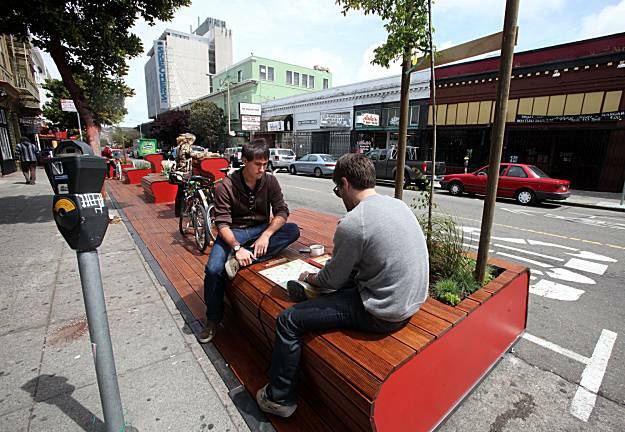 If parklets come, can woonerfs be far behind? The closer I look at this, the madder I get. You might think parklets are an isolated nuisance, but they’re actually one more symptom of the City’s antipathy towards cars. Besides ongoing discussions about making drivers pay a toll to enter and exit the Financial District, the recent decision to enforce parking meter operations on Sundays, and the rebirth of the city’s Sunday Streets program, every parklet makes a statement that the concept of streets being just for driving is quaint. On Sunday, April 15, 2012, from 11 AM till 4 PM, JFK and MLK Drives in Golden Gate Park and the Great Highway, from Lincoln Boulevard to Sloat Boulevard, were closed. “A quality city is not one that has great roads but one where a child can safely go anywhere on a bicycle.” Enrique Peñalosa, Former Mayor of Bogotá, Colombia. That brings us to the ultimate anti-vehicle concept, woonerfs. Woonerf is a Dutch word for an area where motorists share the street with other without antiquated boundaries like lanes and curbs. In a woonerf, people on bikes and on foot have access to the whole street, not just sidewalks. So the whole street becomes a public playpen, Cars can pass each other in a woonerf, but typically only in selected locations. The speed limit is typically about 10 miles per hour. Woonerfs usually include gateways that announce that one has entered the woonerf; curves to slow vehicle traffic; obstacles like trees and play equipment that force vehicles to slow down. And curves, lots of curves. The use of curves makes it impossible for drivers to see how long the damn things are. “Don’t let the driver search for the end of his torment,” a Dutch woonerf expert suggests only half-jokingly. Think it can’t happen here? 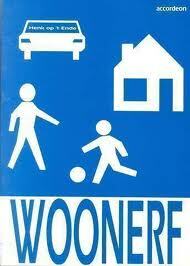 There are more than 6,000 woonerfs in the Netherlands. They have become popular in England and Germany, and several US cities are dabbling with them, including Brookline, MA, and Seattle, WA. I’m trying hard to find a bright side to this trend, and can only think of one. The next time a frustrated parent tells his son to “go play in the street”, perhaps he will get a proclamation from Mayor Ed Lee calling him a model citizen. This entry was posted in Dumb, Dumber, and Beyond and tagged agenda 21, nanny state, parklets, urban planning, vibrant, woonerfs.